Rye breads are very popular in Germany and many different recipes abound. This one uses almost 50 percent rye flour with a sourdough starter to create a strong but tasty sourdough rye bread or rolls. 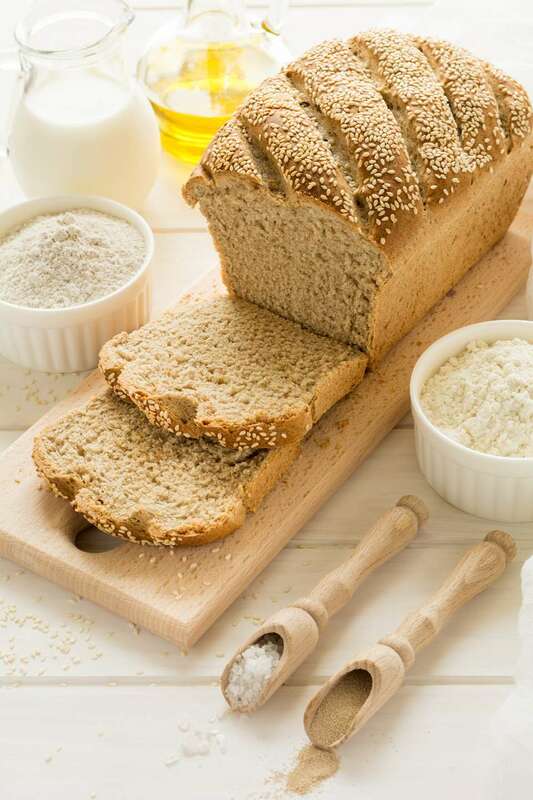 Because some areas in the U.S. carry only whole grain rye flour in the stores, here is a way to remove some of the bran to achieve a lighter rye bread. You could use light rye or medium rye flour with good results, too. Sourdough in the German definition is thought of mainly as the bacterial component, "Milchsäurebakterien" or Lactobaccillus, and how they affect the bread dough and flavor. The wild yeast component is not studied as much and commercial yeast is added to almost every sourdough to ensure consistent rise. Rye sourdoughs rely on acetic acid and lactic acid for their flavor, while wheat sours do better with just lactic acid accumulation, which creates a milder sour taste. Not just the taste, but the way the dough reacts in the oven and its gumminess after baking is affected by the amount of acids in the dough. Acetic acid is formed in stiffer doughs (like this recipe) and at room temperature (24 C or 75 F) while lactic acid is formed in wetter doughs (100 percent hydration) and warmer temperatures (28 C or 82+ F). Because most research is performed to enhance commercial bakeries' quality, the home baker has a little more leeway. Still, a sourdough fed with rye will do better for you in a rye bread recipe and a wheat-fed sourdough in a wheat recipe. If you want to make a lot of rye sourdough bread, then try to find or start your own sourdough with rye flour. Otherwise, a traditional sourdough will do fine for a start. If you have a sack of whole grain or stone-ground rye flour, sift it through a fine sieve (1 millimeter or 1/32 inch mesh) and use the sieved portion for this dough. Retain the bran and large pieces of cracked rye for the crust. You will need to sift another cup or so, to get 2 1/4 cups of rye flour (300 grams). If you have medium or light rye flour, do not sieve. Mix the rye flour with a cup (250 grams) of water and about 2 tablespoons of rye starter (30 grams) which can come straight from the refrigerator. Feed the starter, while you are at it, then return to the refrigerator. When those three ingredients are thoroughly wetted, cover with a lid or plastic and let it ferment at room temperature (about 75 F) for 16 hours. If it is colder than 75 F, you might let it ferment a bit longer. You will not see any physical change in the wet, sticky dough, but you should smell a strong, sourdough smell. Use the entire rye sourdough and add the rest of the ingredients. Mix with a stand mixer for about 7 minutes on low with a dough hook. Turn onto a clean board and knead a few times with your wet hands. The dough is firm but sticky, wetting your hands will keep it from sticking too badly. Form into a ball, place in a bowl and cover with a damp cloth for 30 minutes at room temperature. You may see some rise. For rolls: On a lightly floured board, form dough into 100 gram balls, flatten to rectangles and shape into 4 inch baguettes. Dip the rolls into water and then roll in leftover rye bran or just roll in some white flour for a rustic look (no water). Makes 11 rolls. For bread: Divide dough into two parts and shape into boules (pictorial) or a batard (video). Let bread or rolls rise for 70 minutes on parchment paper, covered with a damp cloth. Preheat oven, preferably with baking stone, for 60 minutes at 450 F.
Slash rolls or bread with a lame or razor blade. Slide the parchment with the rolls onto the baking stone, if you can. Bake with steam (5 minutes of steam) for 25 to 30 minutes (bread 40 to 50 minutes) and turn oven down to 400 F as soon as you put the dough into the oven. Cool bread on racks for dry crusts and eat or freeze as you like. The rolls make great cocktail breads when cut into thin slices.